This whole "weekly update" thing has ended up being far more draining that I'd expected, especially when I spent last weekend clicking through three different Tokimeki Memorial games to write this post on the numerous hidden shooter minigames - and I'm not even done with it! Regardless, please accept this super update for the missed week. If it happens again just chalk it up to me taking a break and actually playing video games for a change. So anyway, I'm surprised we haven't had an article on Gitaroo Man yet, but here it is. It heralds back to the pre-Guitar Hero/Rock Band era of rhythm games, when they were all following in the footsteps of Parappa the Rappa. 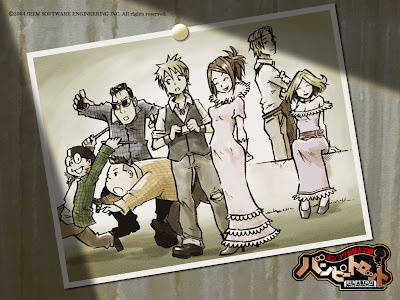 It was made by iNiS, the same guys who made the (even better) Ouendan/Elite Beat Agents series for the DS, which I started on article for three years ago and never finished. Some day! Also up is a look at Lagrange Point, an early 90s Famicom RPG published by Konami that's one of the most technically advanced games on the system, as it was developed to compete with the 16-bit games of the time. It's hard to shake the feeling that it's sort of a Phantasy Star ripoff, but it's impressive nonetheless. Trio the Punch is a bizarre Data East arcade game that's often referenced when talking about cracked out Japanese games, and now you can find out why. Fighter's Destiny is another one of those off-brand 3D fighters that no one really remembers that brings plenty of unique mechanics to the table. Lattice 200EC7 is a strange rail shooter for the PSOne, and Lucidity is an artsy side scrolling platformer published by LucasArts, of all people. Part 2 of the 21st Century Pinball article is up too. The Spotlight Article is Knights in the Nightmare, to flesh out the Sting article. It's long overdue, and it highlights why I don't like to do company features anymore, unless they're defunct. When I initially wrote it like 4-ish years ago, I was all excited and into Yggdra Union, but Knights in the Nightmare is practically incomprehensible (though the review does a good job of explaining it) and Atlus has refused to localize the numerous spinoffs and sequels that Sting has developed since. They did release Hexyz Force, another of their titles which assumedly flopped, but that's not covered as of yet. So if you're into these types of games and want to help expand article, please drop me a line!. And Your Weekly(-ish) Kusoge is Noby Noby Boy, Keita Takahashi's follow-up of sorts to Katamari Damacy. The critical opinion at large seems to enjoy it for its cutesiness despite it being little more than a tech demo, but we are not so generous, and the (unintentional?) sexual metaphors are beyond silly. The Jackie Chan article has also been updated to include a bit about a Famiclone endorsed by the martial arts superstar back in the day. Also, as noted below, Amazon dropped the price of The Guide to Classic Graphic Adventures to $19.44. I don't actually decide when/if this goes on sale, and I don't know whether it's temporary or permanent, so if you've been on the fence for a physical copy, this is the best time! You can read some reviews over at Kotaku and Richard Cobbett's site. It misses the free shipping threshold now, but they've got some good deals this week, including The Witcher 2 for $37, Alice: Madness Returns for $40 ($30 for the PC), and L.A. Noire for $40. I don't actually decide when/if this goes on sale, but Amazon decided to drop the price down a bit, so if you've been on the fence for a physical copy, this is the best time! If you haven't been around lately, you can read about the 772 behemoth we published last month over at the book's page. I just caught wind of this from NeoGAF. Gorgeous looking action RPG made by members of the Xenosaga team. Interesting looking action RPG. Beautiful art design. Probably the least remarkable of the bunch, relatively speaking. Another endeavor from Hironobu Sakaguchi and Nobuo Uematsu. So you know the music's going to be good. The big deal? These are supposedly getting European releases. Xenoblade was already confirmed. Nintendo of America has not made any plans to localize these games, even going so far as to deny NoE a spot to market them because they're not 'planned for the western market'. So how can we change NoA's tune? Glad you asked! There is an increasingly growing campaign, spanning multiple forums and gaming sites (NeoGaf, IGN, Kotaku, Destructoid, Nintendoeverything, and more), trying to get Nintendo to listen up and release Xenoblade (also known as Monado: Beginning of the World), The Last Story, and Pandora's Tower in the U.S. So the deal is this, please pre-order it to help get it released in the U.S. Remember: actions speak louder than words. It costs nothing to pre-order! also, if the game does come out, the MSRP will surely drop to $49.99. If you don't intend to buy the game, don't pre-order just to cancel, and you absolutely should not order more than one copy just to inflate the numbers. It'll cause the campaign to backfire. 2008: Nintendo of America stops localizing select games from Japan. Fans found this questionable, but decided to wait it out a bit. June 2009: Nintendo of America announced Monado: Beginning of the World for release in North america. Monolithsoft fans rejoiced and gave out a small amount of forgiveness over their trespasses in 2008. May 2010: Monado: Beginning of the World is released as Xenoblade in Japan to completely outstanding reviews and overwhelmingly positive impressions on Gaf and 2-ch. Word of mouth of the high quality of the game spread and gave the game some decent legs. North american fans eagerly anticipate the release date reveal during E3 2010. June 2010: During E3 2010, Nintendo had no news / announcements regarding Xenoblade in the U.S. a whole year had passed since E3 2009 -- where Xenoblade was announced for a US release. Nintendo fans grow slightly worried but still very hopeful for an announcement later in the year. 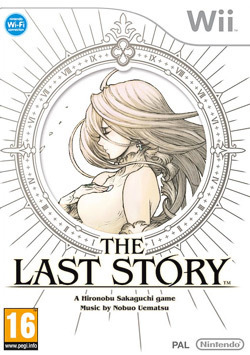 Meanwhile, many other games, such as The Last Story and Reginleiv, were left unannounced as well. June 8, 2011: at the end of Nintendo's E3 2011 press conference, Xenoblade, The Last Story, and Pandora's Tower were still left out of the upcoming release list. With the end of the Wii's life-span fast approaching, Nintendo fans lost almost all hope for a release of the three J-RPGS. June 22, 2011: IGN user themightyme, proposes "Operation: Rainfall," a campaign to get Nintendo's attention and inform them that Nintendo fans are fed up and want Xenoblade, The Last Story and Pandora's Tower. June 23, 2011: Mathieu Minel, marketing manager of Nintendo France revealed that "Nintendo of Europe wanted to show Xenoblade Chronicles at E3 2011, but Nintendo of America wouldn't let them because they didn't want to show products they aren't planning to sell." (http://www.nintendoworldreport.com/news/26928). Nintendo fans start to remove the knives from their backs. June 24, 2011: Clinging to the last bastion of hope, many Nintendo fans started to gather and lend their voice for operation: rainfall. I'll be honest: I highly doubt this will make a difference. But it's definitely worth a shot. For a good long while, I'd known about the Twinbee and Force Gear minigames in Konami's Tokimeki Memorial...but what I didn't know is that each of the ports featured different shooter games, and a number of the sequels and spinoffs had their own unique games as well, which I haven't seen mentioned anywhere on the English speaking internet outside of a passing mention on TVTropes. I only found about them by browsing this wiki. But first, a bit about Tokimeki Memorial - it's a dating simulation that was first released in the mid-90s which exploded in popularity. There's an article for it on the site, although it's much more flippant than the usual stuff, since it was written in the early days, long before it had anything vaguely approaching standards. It is amusingly bitter, at least, but I really don't like the game on the deepest of conceptual levels. I don't care how many different outfits you draw for the girls or how much fluffy music you compose, you cannot reduce the complexities of human interaction into a series of IF-THEN statements. And the whole absurdly romanticized Japanese high school experience is just so far removed from reality that it's almost patronizing. The first games to unlock at your school's cultural festival, these are time trials for Twinbee, where you fly over some generic scenery, fight a handful of bosses, and get your total time tallied at the end. Twinbee Returns is based on the orginal Twinbee arcade game with some slightly enhanced graphics and some scratchy digitized voice. Twinbee Time Attack is based on a combination of Detana Twinbee and Pop'n Twinbee. Force Gear is a short side-scrolling shooter that blends Hudson's Star Soldier with Konami's Gradius series. Many of the enemies are the same, including large versions of the Big Core and tiny versions of the spinning orb boss from Gradius II. The power-ups are the same orange orbs, giant-sized, and even the font is the same. However, the action is a bit different from standard Gradius games. You play as a transforming mech which can fire multi-directional shots when fully upgraded. After firing for a few seconds, you'll also unleash a powerful laser blast. Like Star Soldier, the backgrounds are filled with destructible tiles, which is important when playing for score. The action is fast paced, and your mech is technically invincible up until the final boss, where you can be killed if you're not careful. Although it's short, it's an extremely cool, well designed game. The stage starts with your mech fighting alongside several other ships, before transforming into a jet and jumping into hyperspace. The rest of your squadron is taken out, and you're left fighting the rest of the stage alone. When you reach the level boss, you fight it for a few seconds before a huge tentacle comes out of the side of the screen and skewers it, before jumping into view and commencing attack. The same device was used in the first level of Salamander 2, where you begin fighting the Golem (the one-eyed brain thing from the first level of Salamander/Life Force) before it's eaten by a huge snake thing. The sole 3D game, Stardust Symphony EX is basically a first person rail shooter. You have control over a set of crosshairs and loose control of your ship as you blow up stuff, get power-ups, and avoid enemy fire. In addition to the standard gun, there are two types of bombs - a huge laser, and a screen-searing bomb. There are three stages - an asteroid field, where you face off against a large mech; a desert, where you end up fighting a three headed dragon; and a generic outer space level, where you fight a robotic octopus. It's ugly even for PSOne level 3D, and it's really a bit boring, but it's largely inoffensive. Psyth is conceptually similar to Salamander 2 - you have two options, which can be released to roam around the screen to do damage, and need to be retrieved if you want to requip them. The major difference is that the options will swirl in formation around your ship, loosely protecting it from enemies and projectiles. Both the formation type and your weapon are determined by your speed, which can be set at three different levels. The graphics are colorful and detailed, about what one would expect from a full fledged Saturn game. It begins underseas, as you fly into a cave and eventually through a portal that warps you in the sky, before zoom higher into the clouds to face off against a mechanical spider and a huge shellfish robot. There's a heavy Darius vibe throughout, including the laid back Zuntata-ish score. While it's short, it's not a time attack like Force Gear, and you're challenged to beat the whole stage (about 3-4 minutes long) without losing all of your lives. It's pretty good - out of all of the Tokimemo shooters, this is the one most deserving of becoming a full game. The core of Space Ring Fighter lies in a little energy ring which hovers in the center of your ship. It can absorb enemy bullets, but it's so small that it's a fairly lousy defense. Rather, it's slightly more useful for two purposes - it can be used to fire a homing shot, or summon a giant pair of energy swords to crush foes, similar to the super attack from Treasure's Radiant Silvergun. The homing attack consumes 1/16th of your ring gauge, while the sword attack will consume all of it. The gauge replenishes itself over time, but refills quicker if you don't fire. The ultimate goal is to beat the game as fast as possible. Considering it's part of the name, the ring gimmick doesn't really work, because neither attack is that powerful, least of all the sword attack, which takes far too long to recharge. Coupled with some completely bland graphics that take place against the dull starry background - Force Gear and Psyth looks legions better - make for a pretty lousy experience. The music is boring, although the sound effects are also taken straight from Gradius. PSOne - PSOne memory card Load up game, pick "omake" from menu"
Basically a more refined version of Space Ring Fighter, it's essentially the same game, though with a life gauge, and the goal is to get a high score rather than beat it as quickly as possible. There's also a brief jaunt into an enemy base, complete with a cheap looking polygon rendered background before fighting the boss. As a side note, if you get through all three years of Tokimeki Memorial 2 without getting a girl, you apparently spend the rest of your pathetic existence holed up in your room playing video games. The game on the TV screen appears to use graphics from Twinbee Yahho! Strangely, neither Tokimeki Memorial 3 nor 4, nor any of the Girl's Side games, have any shooting minigames. However, there are a couple more in some of the adventure game spin-offs, Tokimeki Memorial Drama Series and Tokimeki Memorial 2 Substories. I haven't gotten around to unlocking these yet because they're even more tedious to play than the main games, though I did find some videos. (The first series runs on the same engine as Policenauts.) If anyone has any memory card saves of these unlocked, please send them in. You owe me, internet! A bullet hell-ish overhead shooter. This actually appears in two games in different formats. in Irodori no Love Song (featured in the Youtube video), the graphics all consist of text. 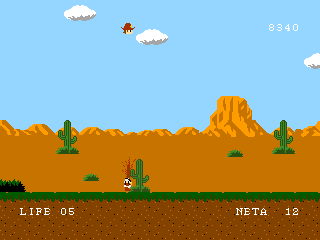 In Tabidachi no Uta, the graphics have been redrawn to look like a regular 16-bit video game. I don't really know anything about this one, because the only thing I can find are videos of the music of the end theme, which apparently people really like. Info coming soon, maybe? Tokimeki Memorial 2 has its own anime-within-a-game, a mech anime called Go Driller! This was turned into an arcade game in this title. At various points, you can go on school vacation and get attached by bears, at which point it changes to a Final Fantasy-style battle. The PlayStation version of the first game (and presumably the others too) features graphics similar to the 16-bit Final Fantasy games. 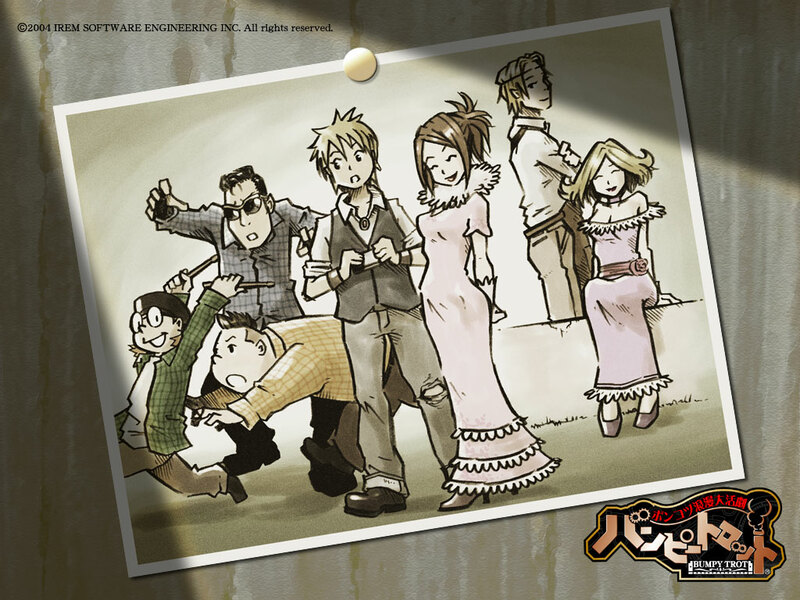 The second game features 3D graphics that resemble a cutesy version of Final Fantasy VIII. ...shoots a laser which tears the bear to pieces, polygon by polygon. What an odd game. Ay carrumba! It's been so long since I mentioned WAHP, the podcast dedicated to Japanese gaming, that now I think I need to mention at least 3 episodes. I've been busy: writing articles, interviewing people, entertaining guests, and I've found information on an unreleased gem of a game (it's not Akira, it's bigger than that). So I've had little time to enjoy podcasts. I only finished WAHP 16 a couple of days ago and then jumped straight to 18, which is post E3. I especially liked Shidoshi's healthy scepticism of the El Shaddai demo. I'll also buy it because it bucks current trends and looks gorgeous, but man, the jumping is just not cricket. 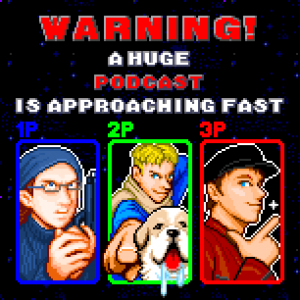 If you've not listened to all the episodes, the news and Japanese twitter coverage will be slightly out of date in the older ones, but the anecdotes are still great (I hope they do a special episode where they just talk nostalgically about the past). Otherwise it's a great 3+ hour source for Japanese gaming information. You can also follow them on Twitter, which is handy for news tidbits. While you're there, follow us too. In vaguely related gaming news, Japanese game by Suda51 and and Shinji Mikami with music by Akira Yamaoka, Shadows of the Damned, is out in America now! Four shorter-ish articles this update: Pole no Daibouken, Sega's goofy parody of 8-bit platformers released only for Japanese WiiWare; Progear, which, until Deathsmiles and Akai Katana, was Cave's only horizontally scrolling shooter; Getsu Fuuma Den, Konami's Famicom game that has popped up numerous times in various games, most recently in Castlevania: Harmony of Despair and Otomedius X; and Bad Day on the Midway, an extremely trippy point-and-click courtesy of the avant garde group known as The Residents. We also have the first in a multi-installment article on 21st Century Pinball, which includes the likes of Pinball Dreams, Pinball Fantasies, Pinball Illusions, and something like a dozen other games with "Pinball" in the title. It's a gigantic article and is working up to be posted over the course of eight weeks or so. The featured article this week is Bionic Commando, as we finally get around to covering the somewhat unfairly maligned Bionic Commando Rearmed 2. Yes, it's on the heels of a game largely regarded as a failure (but was also quite fun in its own way.) Yes, it's more expensive than the first Rearmed and strips out huge chunks of the original game just for the sake of it, and yes, if you bought the PS3 version, you couldn't play it at all during the PSN outage. It has issues, but it's still a really fantastic game, and as to be expected, a high grade soundtrack too. A couple of weeks ago I was browsing Irem’s websites for Zettai Zetsumei Toshi (Disaster Report/Raw Danger) and Bumpy Trot (Steambot Chronicles). I was planning a comprehensive article on the games since the man behind them agreed to an interview, and Irem had lovingly created websites filled with screenshots, character art, concept art, schematics to make your own Trotmobiles out of paper (these were amazing! ), and even the vocalised songs from the game. Everything fans of the two series could want. I grabbed the songs and a couple of screens, but made a note to come back later and save everything else. Well today I find that Irem have removed their websites and all content – all in an attempt to cleanse the internet of any evidence that they existed (they've become "ungames" as one Irem fan put it). Did anyone save their archive of hi-res concept art? All that is left are Wayback archives, which never saved the hi-res imagery. Disaster Report isn’t too problematic, since I can just screengrab more images – but the Steambot Chronicles concept art and Trotmobile designs were beautiful, precious and unique, and now they’re gone forever.